The Zlín Z-526 which hangs in the museum’s atrium. The Czechs have a long and distinguished history of scientific and technical achievement and it’s only fitting that they should take some pride in that. 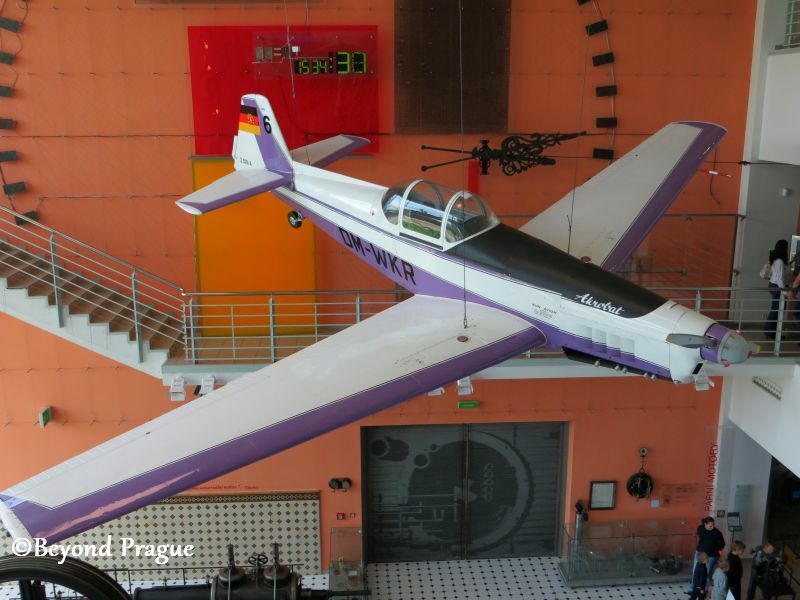 If you’re in South Moravia, the Brno Technical Museum is a great place to see some of that heritage. The main building of the museum is located in the Královo Pole district of Brno and quite easy to access by the city’s public transport system. The building is dominated by a large open atrium with windows on one side to allow a lot of natural light in. Two aircraft; a Zlín Z-526 aerobatics plane and an HC-102 helicopter, are suspended from the atrium ceiling. Both aircraft are products of the Czech domestic aviation industry. Part of the steam driven engines display. The ground floor contains exhibits on engines, computer development and optical tecnologies. The main atrium houses steam driven engines and water powered engines. Some of the steam and water engines are functional and you may be treated to a guide starting one or more up if you’re at the museum at the right time. 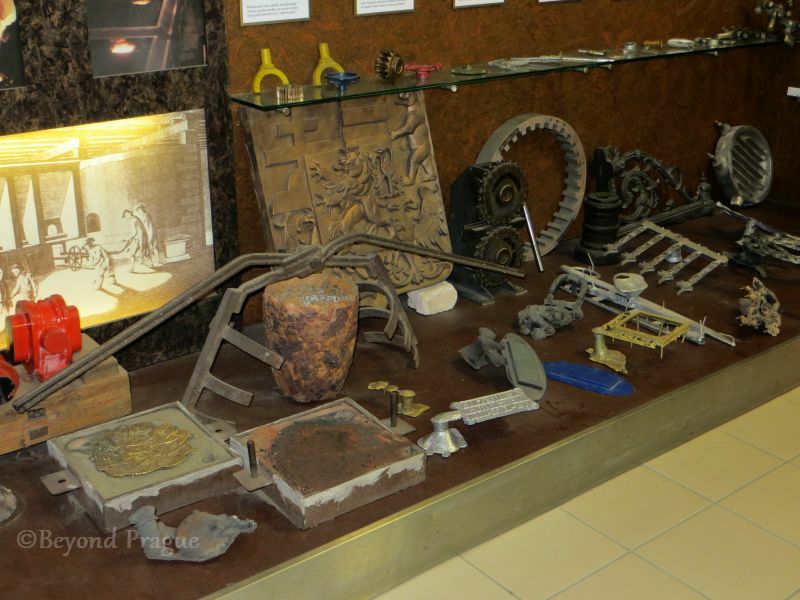 To one side of the atrium, is the display dedicated to aircraft engines. 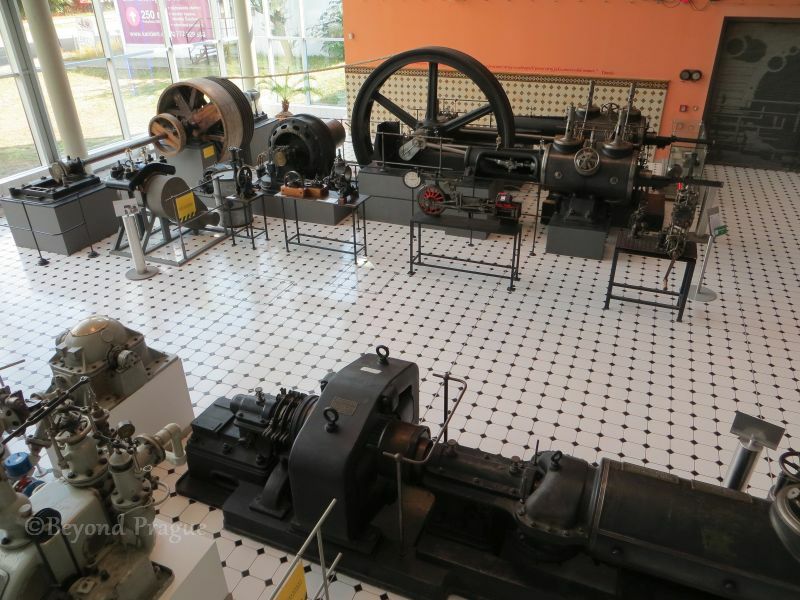 Several engines of various types and era are exhibited in cutaway fashion to allow you to examine the inner workings of them. To the other side of the atrium are the displays of optical technologies and computer development. 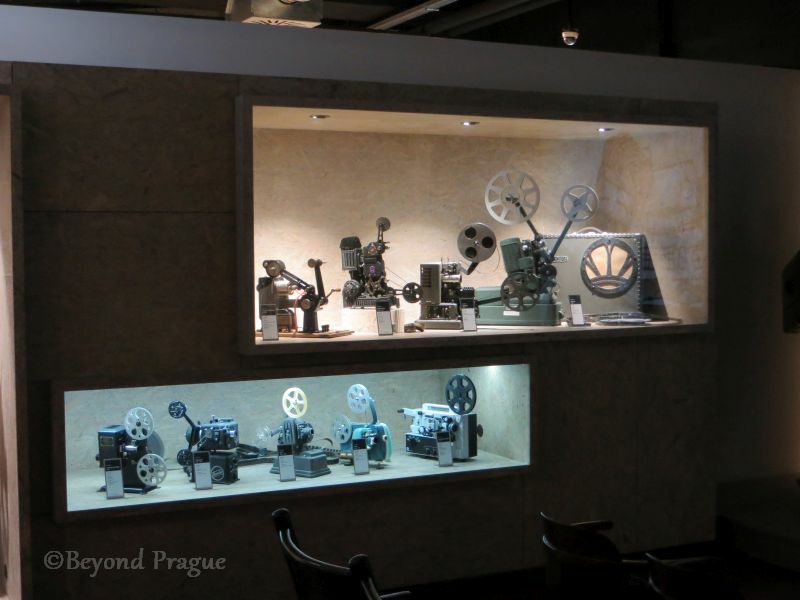 Selection of film projectors in the optical technologies display. The optical technologies exhibit shows the development of both still photography and cinematic projection as well as the development of scanning electron microscopes. There are a few interactive displays in this exhibition which allow you to see how still cameras interpret the information we capture with them and create images from it. 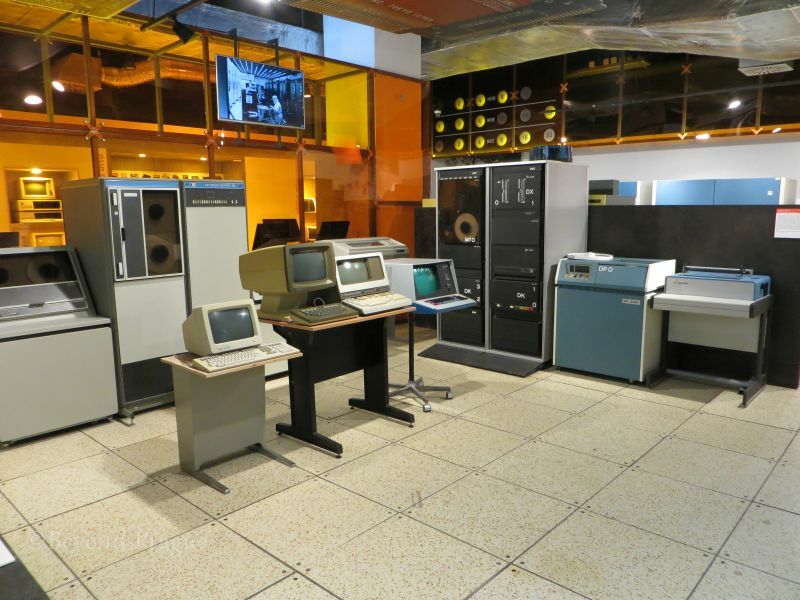 The computer development exhibit is a quite comprehensive and chronologically arranged walkthrough of computer and data storage evolution from old analog mainframe computers and punched paper cards right up to the modern digital age. Racing motorcycles in the “Brno on Two Wheels” display. The main floor contains the entrance, coat room, souvenir shop and ticket desk. Though the museum has no cafeteria, there are a few tables and a selection of vending machines serving drinks and snacks on the main floor. In the way of exhibits, it has a permanent display area concerned with the automotive history of the country and features vehicles from such domestic producers as Tatra, Praga and Wikov to name a few. The main floor also houses the “Brno on Two Wheels” exhibition. 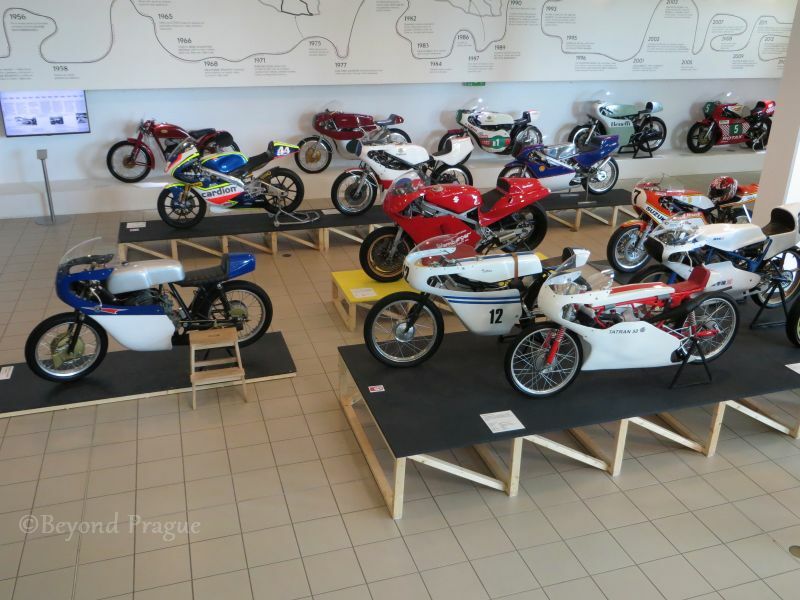 This display focuses on the history of motor sport in Brno. A selection of historical racing motorcycles is on view here as well as a historical overview of the city’s Masaryk Circuit from its establishment in 1930 to the present day as a world class racing facility and stop on the MotoGP tour. 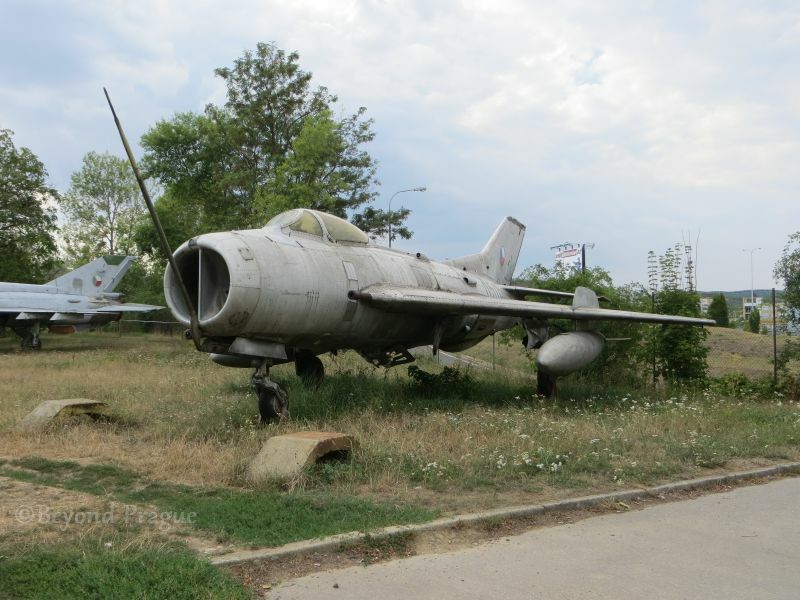 An Aero S-105, the Czechoslovak built version of the Soviet MiG-19 fighter, on display behind the museum. Also on the main floor is a back door which will give you access to a group of four former Czech air force jets that are preserved behind the main building. The aircraft are not fenced off, so they can be examined very closely. As such, care should be taken as there are sharp objects such as landing gear doors that you can injure yourself on if you’re not keeping an eye out for them. It’s best to save a viewing of the outside aircraft for last as it’s not possible to re-enter the museum through the back door. Collecting your coat before you visit the aircraft will ensure that you don’t have to go back in through the front door to get them and can simply make your way to the tram stop in front of the building when you’re ready to leave. Cast metal objects in the metalurgy display. Moving up from the main floor, the second floor contains exhibits on metalurgy, telecommunications, trades, automated music instruments and aids for blind people. The metalurgy section takes you through the history of working metal from the Bronze Age to more modern and refined smithing and casting methods. The second floor also houses a substantial “Culture of the Blind” exhibit which highlights the development of technologies and aids to the blind and visually impaired. Among other things, you will see machines designed for generating and printing Braille text and devices used to teach people to read and write in Braille as well as examples of how daily technology has been adapted for use by the blind. 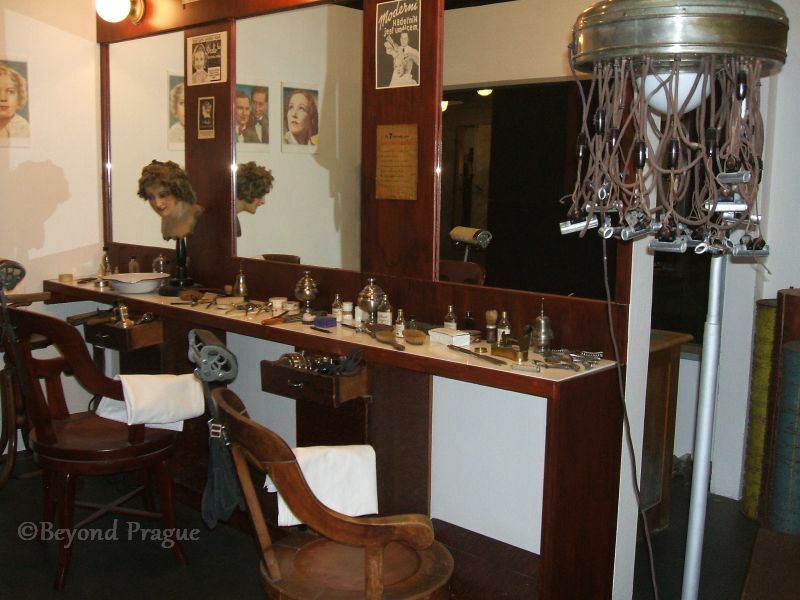 The hair salon in the “Lane of Trades”. Also on the second floor is the “Lane of Trades” a small collection of shops representing trades such as dentistry, bookmaking, locksmiths and the grocer as they would have appeared in the 1920s and 1930s. Additionally, the second floor houses the “Mechanical Music Parlour”, a display of automated musical instruments such as player pianos. A number of these instruments are functional and sometimes a museum guide will start them for guests to not only enjoy the music but also to marvel at the complexity and intricacy of the inner workings of the machines themselves. Looking inside the “Technical Playroom”. The third floor is a bit smaller than the others and consists of two galleries. One takes the form of the “Technical Playroom”, while the other is a large temporary display gallery. The playroom contains a variety of activities that demonstrate many aspects of physics and science in an easy to understand way. All of the displays have instruction and explanation leaflets in Czech and English. While it does not possess the flash of a modern, computerized science centre activity room; it is still an effective and enjoyable place for kids and adults alike to play with science after a trip through the rest of the museum. Part of the computer development display on the ground floor. The museum is easily accessed by a public transit tram line which has a stop directly outside the museum building. I would advise giving the main museum building at least two hours to properly take in. I would also advise you to eat before you go as the museum does not have a cafeteria, only a few vending machines. Several of the exhibits have bilingual Czech/English notes to go with them, for those that don’t, the museum usually has some English language leaflets nearby. The Brno Technical Museum is not limited to the main facility, it is in fact a large complex that is responsible for a variety of preserved technical sites and monuments throughout the South Moravia region. If you visit Brno in the spring or summer months, you may see some vintage trams running around town or even get the chance to ride on one of them; these are part of the museum’s collection as well.